While everyone is endlessly told about the world-ending dangers of Brexit, I wonder if we should be paying a little more attention to Deutsche-it. If the UK leaves the EU the EU will survive. But what happens when – and surely it’s no longer if – but when Deutsche, Germany’s biggest and only truly global bank has to be rescued? What will the fallout from that be? I am sure the German authorities will claim its not a rescue its a merger. Yeah right! It’s a rescue. Deutsche’s shares have fallen 48% in just the last 12 months – the same time the management said they were going to have the bank turned around. The bank’s shares are now worth no more than they were nearly 40 years ago. Which is not such good news. But there’s worse. While, and perhaps in part because(?) Deutsche’s share price has been in free-fall, Deutsche has been money laundering around the world. That corruption is now beginning to catch up with the bottom line that it had been pumping cash into for so long. Deutsche is being investigated after the Panama papers revealed its roll in industrial scale tax avoidance and money laundering. No sooner had the ink dried on that headline when the revelations about Deutsche’s central role in laundering money through Danske bank drew yet more investigators to its HQ like flies to a fresh and steaming turd. Now don’t get me wrong I’m not saying this makes Deutsche special among big banks except in the category of being caught. There, they have certainly wrestled the crown from Citi and Wachovia. What I am saying is that that much laundering in that many localities is going to mean the usual bankers defence of ‘one bad apple’, ‘one corrupt employee’, ‘one weakness in our otherwise impeccable rules which are now being updated etc etc’ is not going to wash (sorry I couldn’t resist) so easily. Deutsche is a dirty bank. But does this mean Deutsche could be brought up on corporate criminal charges? Not a chance. To do that could mean it would lose its banking license and that would be Deutsche-it. And Deutche-it would be far more dangerous to the EU as a whole than Brexit. 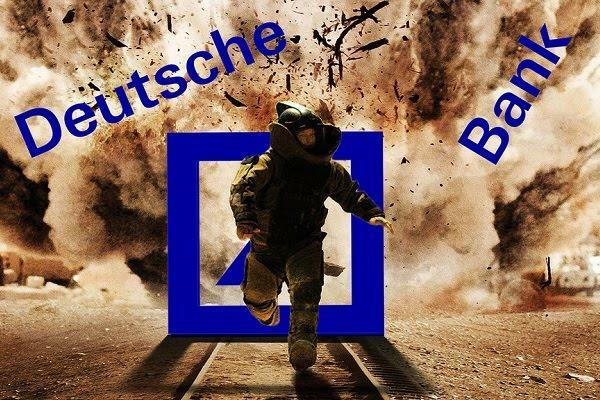 Deutsche is a filthy, systemically dirty bank but a bank which the German state is going to save. Using tax payers money. But how? Of course every nation has such a bank, we certainly do here in the UK. But it is full of irony that the self-proclaimed capital of fiscal prudence is going to be intervening to save its flag-carrying bank and not just save it but do so in a way that makes a mockery of all the fine words about lessening systemic risk and tackling the problem of Too Big To Fail Banks. Surely we all now have to admit that all that fine talk was just so much political smoke blown up our collective rear ends? By merging Deutsche with Commerzbank, which is itself one of the global Banking-Dead, being still part owned by the German tax payer – much like our own moaning, shuffling, dribbling RBS, the German ‘regulator’ will be creating an even larger corpse. Of course old habits are hard to kick and the German answer to every failing bank it has ever had, has been to merge it with another. They did it way back in the 90’s when they created HVB from two failing Bavarian banks and again with Hypo and Depfa just before the crash. It never works for them but they keep on trying. To be fair, so does every other financial regulator in every other country. Maybe they are all related? Anyway, it will surely happen and what it will create does make political if not economic sense. At the moment Deutsche is a G-SIFI, A Global – Systemically Important Financial Institution. Every self respecting nation wants to have one. Deutsche is Germany’s. The other, unofficial name for G-SIFI’s is TBTF. Except, and here’s the rub, there is and always has been little gap between those two concepts, that has niggled away at bankers and their political friends all these long years of the wonderful recovery we have been having. And that gap is that being a G-SIFI, being on the official G-SIFI list, actually, legally means you can fail but are so important you have to fail in a special way. You have to have a special ‘Last Will and Testament’ in case of your untimely demise. It means there are special rules you are bound by concerning your capital holdings and how you are supposedly going to be – should you fail – wound up in a special way that protects the rest of us from your implosion. It doesn’t mean you are Too Big To Fail. The idea was that our wonderful and prudent rulers and regulators would create new rules to prevent banks failing (which sounds a little like TBTF, but isn’t) because IF they did fail then they would be wound up in a way that protected the rest of us. The problem is that’s not what the bankers want at all and certainly not what the countries who house those banks want. What nation wants its largest bank to fail, ever? What would happen to Italy if UniCredit imploded? What would happen to Spain if Santander died? Or the UK is HSBC was ever really caught out like Deutsche has been? The answer is no one knows and no one is prepared to find out. The G-SIFI bank wind-up rules are there because in the teeth of the political fall-out from the bank crisis our rulers had to be seen to do something. But no G-SIFI bank and no nation housing one is every really going to allow a G-SIFI to go down. ‘G-SIFI’ is what we have officially but unofficially what the world of finance is sticking to is TBTF. Just, Too Big to Ever, Ever be allowed to Fail …no matter what. The question is how to be TBTF while officially merely being G-SIFI? And the answer, straightforwardly I suppose, is to make G-SIFI’s bigger. So big that failing really isn’t a viable survivable event – at least not politically. Which means merge Deutsche with Commerzbank, either of which could just conceivably be wound up, and create something so sprawlingly immense that it just is TBTF. That makes sense doesn’t it? Could Germany ever allow Deutsche and Commerzbank to fail at the same time? No, of course not. Personally I don’t think the German state was ever going to allow Deutsche to go down. The flag carrying bank is a very different animal to the flag carrying airline. One can go the other can’t. Combining Deutsche with Commerzbank closes that risky gap between being systemically important and being truly too big to fail. Brexit can conceivably happen – though if it does and a general election returns a Corbyn government afterwards, then I think we will see engineered ‘regime change’ of the kind that we are used to allowing our rulers to impose upon Ukrainians, Iraqis, Libyans and Syrians, being imported into the heart of the Industrial North. Brexit and then Regime Change in the UK? Yes. But Deutsche-it? No, not a possibility. If I’m right then expect other nations to follow suit and when the next crisis hits we’ll see the creation of the truly TBTF mega banks.